On Sunday, December 30th, Pasadena and Altadena pastors, law enforcement officials, community leaders and members will stand together at All Saints Church in Pasadena with a united voice to issue a community call-to-action in response to gun violence in our streets. "When something is wrong like the gun violence plaguing our citizens, it is because we have forgotten that we belong to one another,” said All Saints’ Rector Ed Bacon. “The Pasadena community is standing strong together for peace and security in our neighborhoods,” said Ricky Pickens, Director of Prevention and Intervention Services at the Flintridge Center. The community call-to-action in Pasadena and Altadena will include communicating messages of peace and hope in our neighborhoods; calling for respect for and respect by law enforcement in our communities and helping those who want to escape the cycle of gang violence. William Syms and Porfirio Frausto, community leaders. Sunday, December 30 | 3:00 p.m.
Ed Bacon writes to urge President Obama to turn this national moment of mourning over the shootings in Newtown into a national movement for gun safety. To add your name, email the Peace & Justice Department at All Saints Church. On behalf of this community of faith, I want to express my deep gratitude for your strong expression of support for urgent action in the face of yet another horrific mass shooting in our nation. Parishioners join me in letting you know that you have our full support as you provide leadership in enacting measures that will help prevent these kinds of mass shootings, as well as the tragic loss of lives of no less than 32 men, women and children in our country every day. While we still grapple with identifying a comprehensive and holistic response to the Newtown tragedy and others like it, including the need for more effective mental health and wellness programs in our communities, there are some immediate and necessary steps that we need to take regarding gun safety. I strongly support the reinstatement of the assault weapons ban that Senator Feinstein has said that she will introduce at the beginning of the new session of Congress. I support as well legislation that would require background checks on every gun purchase, including those at gun shows, and limiting the size of ammunition clips. 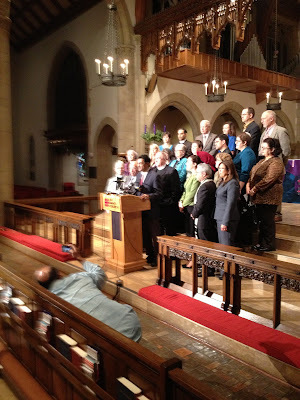 As part of our continued commitment to this issue we will be mobilizing our parishioners, who live in as many as twenty different Congressional districts, to contact their Representatives to urge them to support new gun control legislation. Early in our faith history the assembled people hear God speaking these words through Moses: “I set before you life and death, blessing or curse. Choose life, that you and your descendents may live.” We and our elected officials have that same choice today and must act with courage and the resolute determination that this epidemic of gun violence requires. As we in our faith tradition await the celebration of the birth of Jesus where the angels sang of their vision of peace on earth, we commit this parish to the task of making this a peaceful, safe and secure world for every cherished child of God. The Reverend J. Edwin Bacon, Jr. 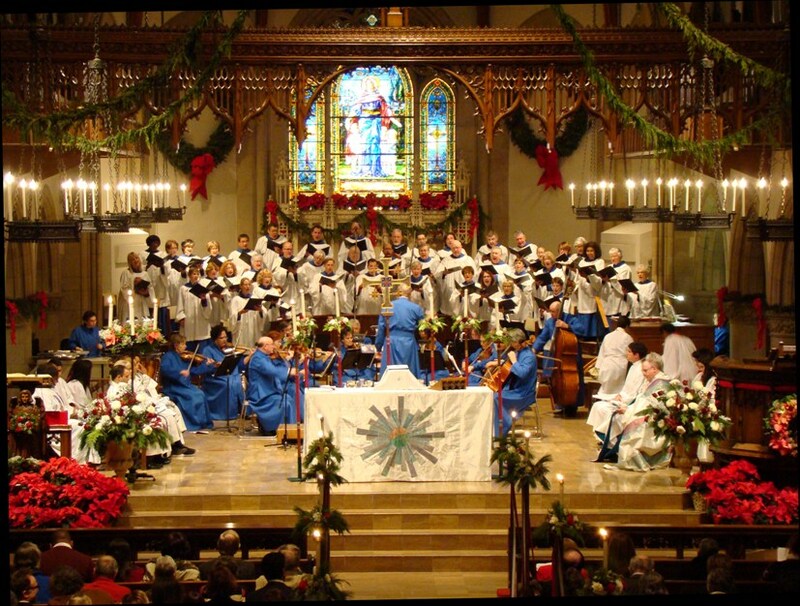 The rector and friends tell the Christmas story; Our chilrdens' choirs, the Mastersingers and Troubadours, directed by Jenny Price, offer music of Donnelly, Strid & Schram. Our youth choir, the Trouvères offer music of Tierny and Wilhousky, with instrumental ensemble, directed by Jenny Price. This service will be signed by an American Sign Language interpreter. Canterbury Choir with chamber orchestra, offer Messe de Minuit pour Noël, by Charpentier, and music of Holst, directed by James Walker. Coventry Choir with chamber orchestra, offer Mass in D Major by Dvorák, and music of Howells and Mathias, directed by James Walker. Early arrival helps ensure seating. All Christmas Eve services are well attended, plan to arrive at least 30 minutes early. Parking for 3 p.m. Christmas Eve service will be in the North Lot or underground at the Westin Hotel (enter from Union Street). For the 5:30, 8:00 and 11:00 p.m. services, parking will be available at the Kaiser parking structure or underground at the Westin Hotel (enter from Union Street). Child care will be provided for all services. 10:30 a.m. Eucharist Susan Russell preaches, and Coventry Choir soloists sing carols arranged by David Willcocks. Child care is provided. Monday, Dec. 31, 7:30 p.m. in the Church. Canterbury Choir soloists offer music. Ed Bacon preaches. This special service is a wonderful way to prepare for the new year. Child care provided. Although the event has been on the calendar for months -- and All Saints Church being actively involved in interfaith activities is hardly "news" -- last Friday, November 30 an article appeared on a conservative blogsite critiquing both All Saints and MPAC. Entitled "California Church to Become Site of Islamist Convention" the article was sponsored by the Institute for Religion and Democracy (IRD) and full of mischaracterizations about MPAC as an organization and our friends Dr. Maher Hathout and Salam Al-Marayati as individuals.